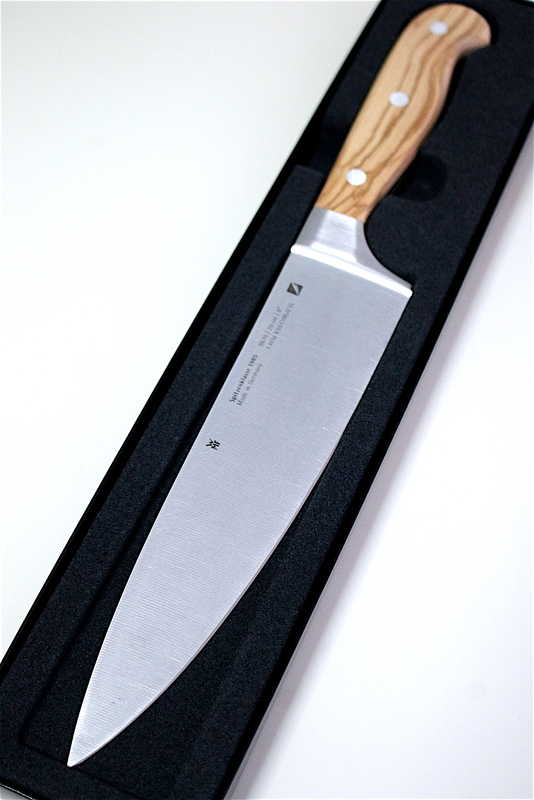 I am now happily the proud owner of a WMF Spitzenklasse 1985 Chef's Knife (20 inch blade, S$179). 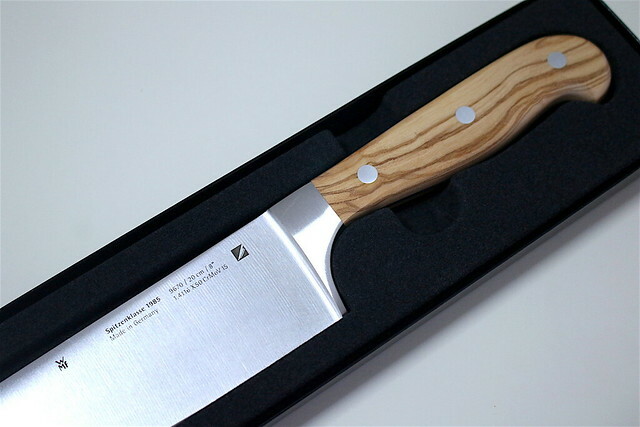 The ‘Made in Germany’ Spitzenklasse 1985 series is a limited edition series specially created to mark the 30th anniversary of Spitzenklasse Plus, WMF's classic range of knives. Spitzenklasse means "top class" in German. The Spitzenklasse 1985 has the same tried-and-tested quality features but what makes it special is the high quality olive wood handle. The natural material is not only beautifully chic, it sits comfortably in your hand. I love the retro feel it exudes. And the gleam of the steel is simply mesmerising. WMF blades are known for their “Performance cut Technology”. Quality blades are manufactured with precise sharpening at an exact constant angle while the new refinement of the steel makes it finer, harder and less prone to corrosion. 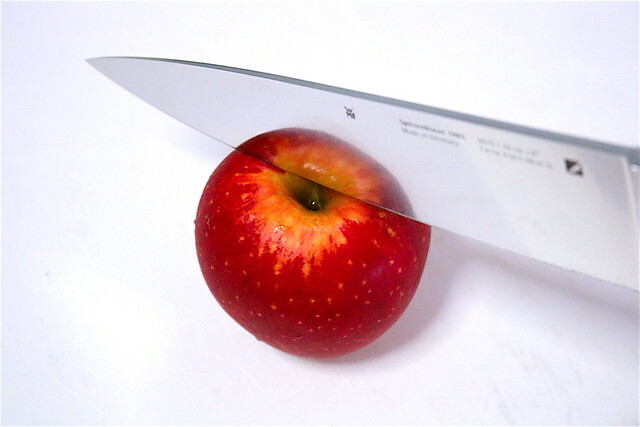 This results in knives with long-lasting superior sharpness. The hardy Spitzenklasse Plus series (above, left) has ergonomically riveted handles made of high-grade synthetic material. They are seamlessly processed and guarantee optimum hygiene. That's a good point because I've seen knives with handles that corrode over time, leaving exposed rivets. All the knives have a balanced weight distribution and rounded edges that sit safely and nicely in the hand. The bolster provides the right balance and serves as a finger shield. Cutting with a WMF knife is always a pleasure: feeling the blade sink and glide smoothly as you cut through a myriad of items. It's not only efficient, it's also safer than a blunt knife as you don't struggle as much and items don't slip under a blunt edge (also, no accidental finger-slicing). It is fast becoming my favourite kitchen accessory, making almost all my other knives redundant. I remember the first time I handled a WMF knife. 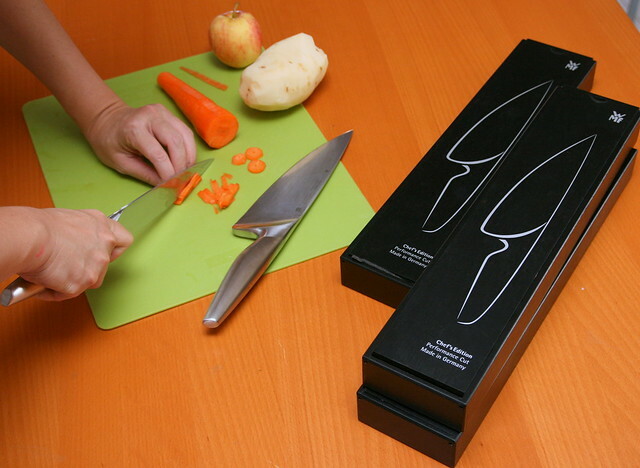 It was the Chef's Edition series of knives designed for aspiring chefs and professionals. These are pure awesome. Made entirely of stainless steel, with a smooth transition from blade to handle, they not only look cool, but cut through everything like butter. Personally, I think these are the best performers. 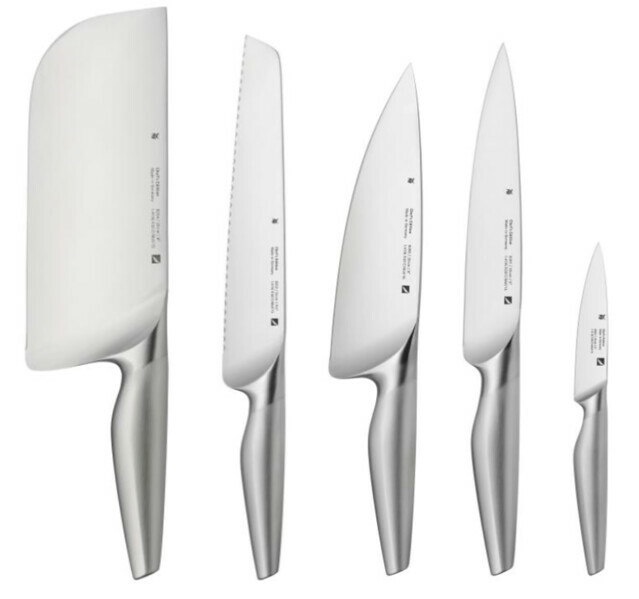 They are introducing a Chinese Chef's Knife (far left, S$269) for this range in July 2016. I still think the Chinese cleaver is the most versatile kind of knife; it is the ultimate multi-tasker - debone meat with the sharp tip, smash garlic with the flat blade, pound meat with the spine, cutting paper thin slices of vegetables, removing the skin from a fish, and peeling ginger. This is next on my Christmas wishlist! A good quality knife makes a world of difference in your cooking experience. It is often said to be the most important tool in the kitchen. Invest in a good knife that lasts, and you'll save yourself headaches and also reduce waste by throwing away fewer knives. From 9 May to 24 July 2016, WMF will be offering a complimentary parer knife (worth S$19) with minimum purchase of S$100 worth of WMF knives, while stocks last.